Chimayo has a home! 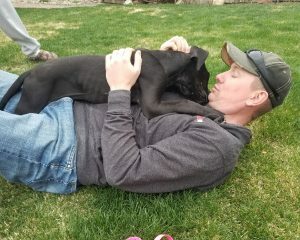 - Rocky Mountain Great Dane Rescue, Inc.
Chimayo has a home with his foster family in Fountain, CO. Brandon is no stranger to Great Danes as he adopted his last Dane “Sherbert” from RMGDRI back in 2010. Sweet Sherbert has since passed and Brandon is now ready to fill his home and heart with another Dane. When a litter of sick puppies came into rescue he raised his hand to help one of them. This is when Chimayo entered his home! The two have bonded immensely and Brandon couldn’t bare to part with him. He has affectionately renamed him TANK. Way to go sweet boy.